A breakout session, also known as a breakout meeting or workshop session, is generally a workshop, discussion, or presentation on a specific topic that serves as a portion of the agenda of a larger program, seminar, conference, or convention. All well-planned programs have an overarching theme to which all agenda items by they scheduled talks, activities, or perhaps a keynote speech are geared to discuss or elaborate. Breakout sessions offer the program attendees another opportunity to discuss, reflect, or act upon those themes in a more intimate or specialized setting. Breakout sessions come in many shapes and forms, but their one unifying characteristic is that they are relatively short sessions (as compared to the greater agenda) in which small groups of conference or convention attendees meet to discuss or learn about relevant topics relating to the greater theme of the larger or main program. 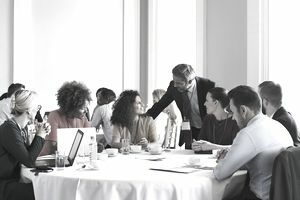 Generally, multiple breakout sessions occur simultaneously, with all attendees participating in a small group for a designated period of time before returning to rejoin the greater group. As such, breakout sessions require some method of breaking up the larger group attendees into smaller groups and an objective whether it be the completion of an activity, an opportunity to discuss a topic or the call to brainstorm. In a larger program perhaps with a large audience, the primary benefit of breakout sessions is that they serve as an opportunity for all program attendees to participate more actively. Many programs' agendas are dominated by a series of presentations during which the attendees are merely passive audience members. While this can be a great format for sharing information and insight, it has been shown that when people have been given the opportunity to actively participate, their engagement with the material can lead to better retention and implementation down the line. Breakout sessions are also a great way of encouraging engagement with even those quieter attendees. Many people feel much more comfortable sharing their ideas with smaller groups rather than the entire audience. A breakout session might prove to be a perfect opportunity for attendees to share ideas or observations or even raise questions that they might not otherwise share with the group. When breakout sessions come back, those ideas and questions can be then shared with everyone in attendance. Breakout sessions may also offer conference coordinators the ability to better meet the needs of their attendees. Breakout sessions may be offered to speak to specific areas of interest or to delve deeper into a certain topic that relates back to the program theme. Breakout sessions can also be organized by skill level (such as beginners and advanced) or by role or position (such as entry-level and managerial levels) to better speak to the group. Breakout sessions also offer a way for presenters and meeting coordinators to "break up" the agenda productively and breathe live into the program. While meals and short scheduled breaks are generally a must for programs that span more than a few hours, breakout sessions can offer attendees an active and productive break from passive listening and learning, which can aid in prolonging their attention span.